Posted: Tue 15 Dec, 2015 1:48 pm Post subject: THE WINNER: Get Yo'self a Falchion! 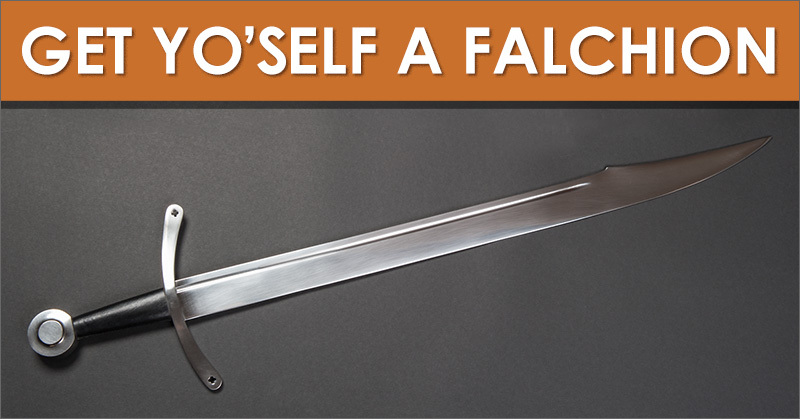 We just finished our Get Yo'self a Falchion contest. This contest was open to everyone on the site. 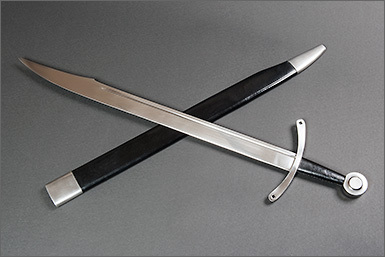 In total, 359 people entered, but there was only one prize: a Windlass Steelcrafts Falchion. Kai Lawson wins the prize!! Please take a second and give him some congratulations! I hope everyone enjoyed entering and hoping to be the winner. You'll all get another shot at winning something soon because, even as I write this, I have another prize in the mail coming my way. I'll give it away early in 2016! Congrats Kai. Hope you enjoy your new toy. Congratulations on winning a falhion. i have never met a falchion I have nevr loked. A bit of an odball of a sword thatgrows on some. Congratulations, Kai. That's one of the better Windlass offerings. Everyone should have a falchion. I'd just like to thank 1) Nathan for holding this contest and for the continued running and upkeep of this terrific website, 2) luck for picking me this time, 3) and all the other people who use and visit this site, and help make this kind of thing possible. 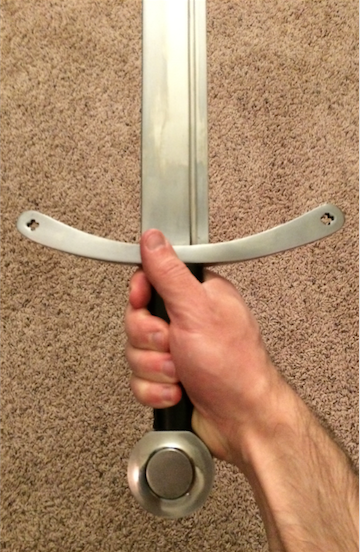 I'll post my thoughts on the sword here soon after I get a chance to use it; the backlog of condemned plastic jugs sitting in the garage is rather high, so I anticipate good thing to come! Congrats Kai! I love these contests! Three cheers for Nathan and for myArmoury! 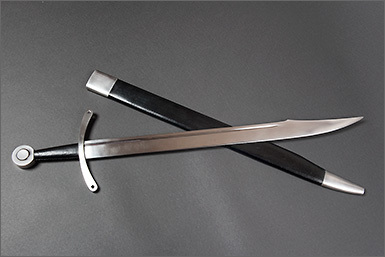 Kai congratulations on winning the falchion, it does look like a nice one. I have a few Windlass pieces and I find that the heat treat seem very decent with most, and they can take a good edge, this falchion also looks historically accurate or plausible. Congrats Kai - thats a pretty cool piece of steel you're acquiring! And big ThankYou's to Nathan and all the Mods for all your work! Congratulations. It's very aesthetically pleasing. I look forward to hearing how it performs. Finally got around to taking some photos--apologies for the crummy quality. 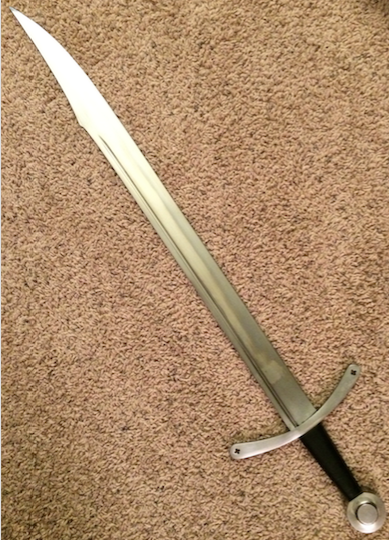 The sword is shorter than I expected, but is also narrower and thinner than I thought it would be, making for a very large knife-like visual, though it absolutely feels like a sword when swung. 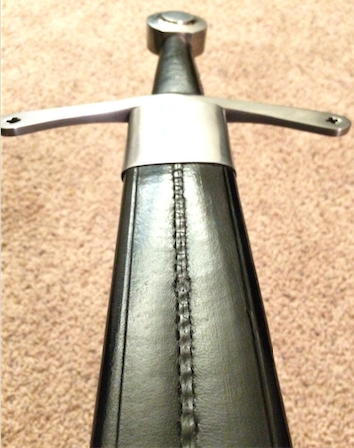 The hilt furniture is sound, and the scabbard is functional and well stitched. I think that basic improvements to this sword could elevate it quite a bit. 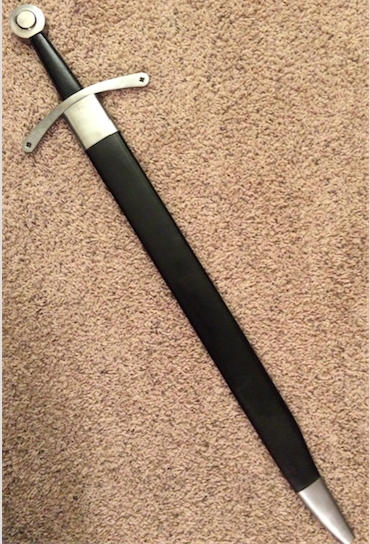 The pommel could be reshaped and thinned a bit, and the grip could be replaced easily for improved control. The overall weight of the piece isn't too high, but I think adding some distal taper to the blade would help it liven up a bit in hand. I personally don't care for the mirror finish on the blade, but a few passes with a very fine scotchbrite pad would remedy that. Overall, I think that it is a surprisingly nice piece, and I look forward to dressing it up a little. Thanks a ton for posting photos and your thoughts. I think your photos are actually quite good! I must say that I agree with you on all accounts. 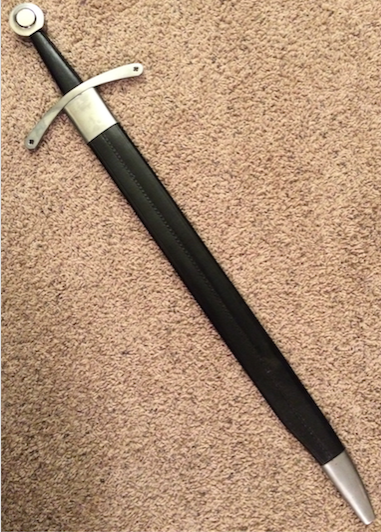 It's a really good sword for the price and is probably one of the better offerings from Windlass, at least as far as I'm concerned. I think the best part of the sword is what can be done with it. I like the thoughts you have and think they're spot on. It screams for a re-grip and a grinder to smooth out some details certainly wouldn't hurt. Sending it to somebody like JE Sarge / Crusader Monk was always my intention with that piece, but my funds and the timing with him going back into military service, etc. never quite lined up.